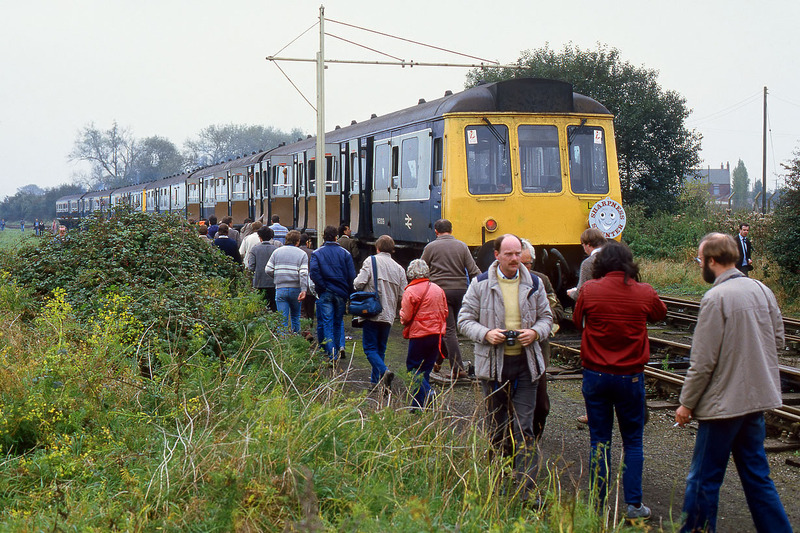 Branch line railtours, 1980s style! Very little health & safety concerns here, as the passengers from the Monmouthshire Railway Society 08:10 Cardiff Central to Portishead 'Sharpness Shunter' railtour have climbed down onto the track and wandered freely all over the trackwork at Sharpness on 26 October 1985. They are seen here heading back to the train, with one or two grabbing one last photo. The train comprises Class 118/119 hybrid set L579 (51319, 59424 & 51065) & Class 117 L418 (51355, 59507 & 51397). 51319 is nearest the camera.